Light blue. I am obsessed. 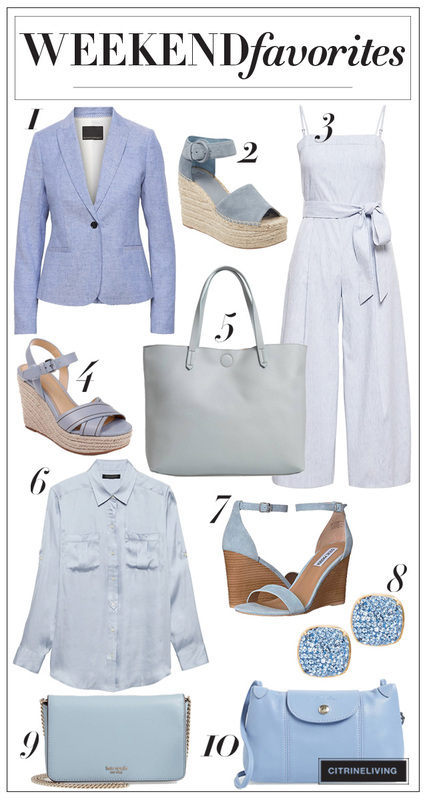 I want everything I can get my hands on in light blue – I have been eyeing a gorgeous pair of wedges (#2 below!) that I have to have and I am craving to fill my spring wardrobe (and our home too!) with this hue. It’s airy, fresh, crisp, and so clean feeling – like I said, I’m obsessed. This week’s edition of Weekend Favorites brings you a roundup of light blue wardrobe staples that I am in love with and that I thought you’d enjoy too. « SPRING COFFEE TABLE DECORATING + STYLING TIPS! LOVE-LOVE-LOVE~~Blue is my favourite as well. 2 years ago I started adding more pinks into my home…but I am constantly drawn back to the blues. I purchased a lot of blue and white items in FL this past season. I am anxious to get home and get the Corner House spruced up for spring. I just bought a onsie from Dillards that’s bl/white too. I love them but they are a pain when you are out for dinner and have to go to the lady’s room!! LOL. Great choices on the wedges that you show!! So pretty!! I love your sofas. I was wondering if you can tell me what the name of the fabric color selection is? Hi Jane! Thanks for asking! This fabric is called Zulu Vanilla!